A basic uncertainty for climate science is in understanding the net effect of clouds on the radiative balance of the earth . Clouds regulate solar heating by increasing the planet’s albedo while simultaneously absorbing infrared (IR) from the surface. This interplay between albedo and greenhouse effect of clouds is complex and varies with latitude and with season. The net radiative forcing from cloudy regions is So(1-α) –F, where F is the outgoing IR and α is cloud albedo. On a global scale the Earth Radiation Budget Experiment (ERBE) measurements have shown a net cooling of around -13 watts/m2, which is four times that expected from a doubling of CO2 alone . However, more recent measurements from the Clouds and the Earth’s Radiant Energy System CERES  show that the net average cooling effect of clouds is larger (-21 W/m2) (Figure 1b). It is often assumed that changes to cloud cover are a feedback to CO2 forcing rather than an independent phenomenon. A change in climate can induce cloud changes which then feedback into the initial climate change. This effect is built into most Climate models, which then result in a mean cloud feedback of between 0-2 W/m2/°C . Radiative forcing from increasing CO2 levels is rather well understood , but its direct impact on cloud cover is unclear. Feedbacks cannot be too large compared to the Planck response as otherwise they soon become unstable as f approaches 1. Global cloud cover variations measured by a number of satellites under the guidance of the International Satellite Cloud Climatology Project (ISCCP) are subject to uncertainty linked to data acquisition methods , and viewing biases . However, we have found previously  that using sunshine hours at surface as an inverse-proxy for cloud cover confirms the ISCCP results over the UK. In private correspondence, NASA have also provided assurance that data acquisition and corrections are now reliable and that the ISCCP data are therefore robust. 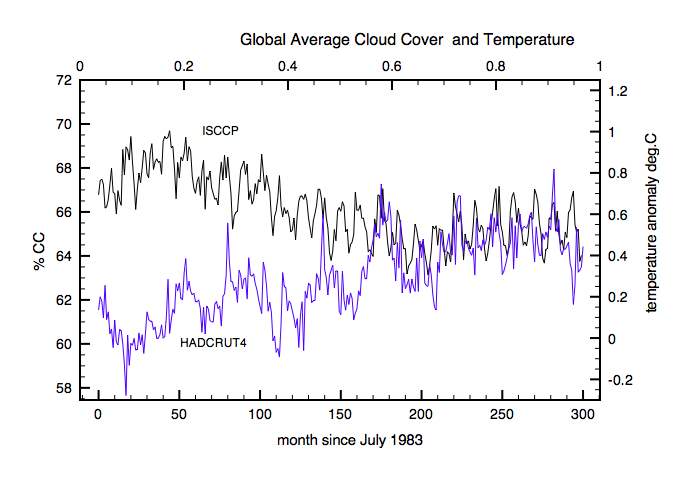 Figure 1a shows the ISCCP global averaged cloud cover  compared to Hadcrut 4 global temperature anomalies . Until 1998 cloud cover decreased in line with increasing CO2 levels, which may support the existence of a CO2 feedback. 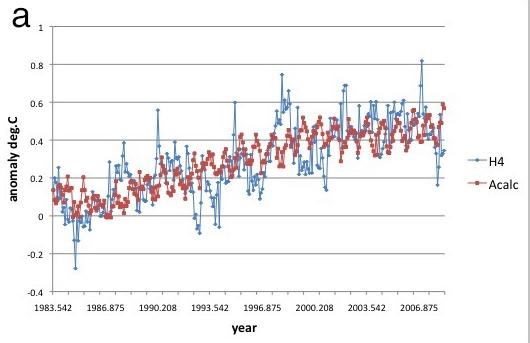 However, since 1998 both cloud cover and temperatures have remained flat while CO2 forcing has continued to rise. This is evidence that cloud cover does not depend simply on CO2 forcing alone and may itself be a major natural driver for climate change. There is no direct evidence that cloud cover varies in response to CO2 and the ISCCP data discussed here is cyclic in nature which cannot be explained by unidirectional CO2 forcing. We have therefore developed a model that treats clouds and CO2 forcing independently and separately. Mearns and Best  have reported evidence that changes in cloud cover can explain approximately 40% of the UK surface temperature changes since 1956 especially during summer months (June, July, August). We now apply essentially the same model on a global scale using data from the ISCCP  that we downloaded from the US National Oceanic and Atmospheric Administration (NOAA) web site [ref] since the NASA web site has been disabled [ref] referenced to measured surface temperature data from CRU-Hadley (HADCRUT4). ISCCP cloud data is available beyond 2008 but is not yet in the public domain. where 3.5 Wm-1°C-1 is the Planck response DS/DT for 288K and is the increase in IR radiation for a 1oC rise in surface temperature. We initialize the model by normalising the first data point Tcalc(July 1983) = Thcrut(July 1983) and then calculate all subsequent monthly temperatures based only on the measured changes in ISCCP Cloud Cover (CC). 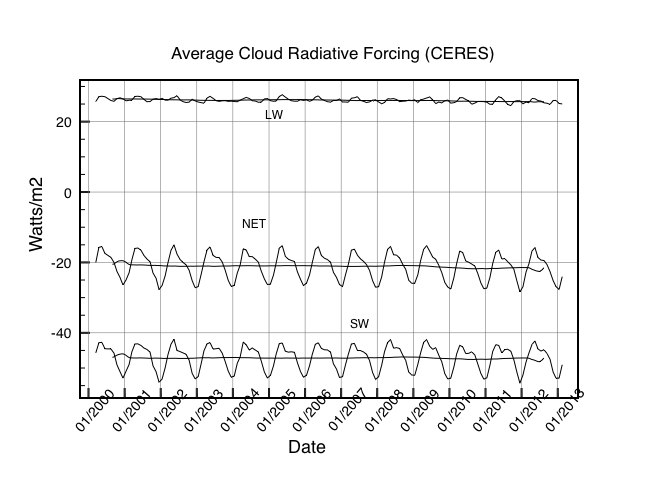 We fix NCF = 0.91 as measured by the CERES for global net cloud forcing. where ΔS is the monthly change in radiative forcing,CO2(y)/ is the concentration of CO2 in the atmosphere for month y, and CS is a factor representing climate sensitivity. CO2 values are the measured monthly Mauna-Loa data . The model with CS=1.0 then corresponds to an equilibrium climate sensitivity (ECS) of 1.1°C. However, when the model is applied to contemporaneous temperature data, CS corresponds instead to the transient climate response (TCR). 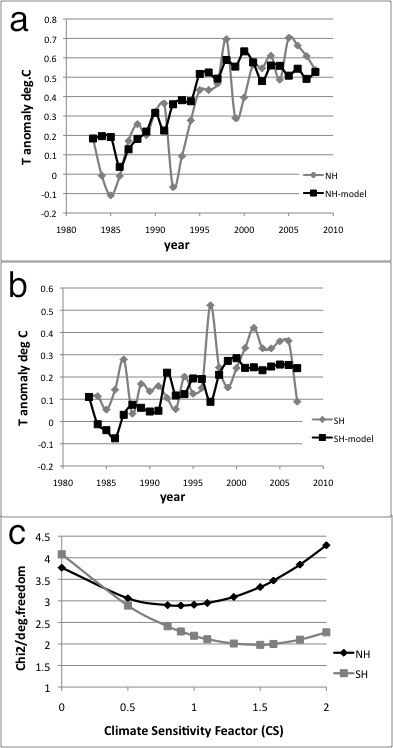 Climate models with net positive feedbacks yield larger values of ECS of between 2 to 5°C . The model value of CS is to be determined empirically from the data. We apply the model to calculate global temperature anomalies from variance in global cloud cover after normalising the start point (July 1983) to the measured global average temperature and then compare model output to measurements of actual temperature variance as recorded by HadCRUT4. Our criterion for goodness of fit between the model and HadCRUT4 is based on the use of χ2 per degree of freedom (χ2/df). For Χ2 we take a measurement error of 0.1°C for the monthly anomalies. The χ2 results found by varying CS values with NCF fixed at 0.91 are shown in Figure 2b. A minimum in χ2 is found for CS = 1.45 corresponding to TCR = 1.6 °C. The error on CS is determined by how much variation is needed to shift χ2/df by 1. 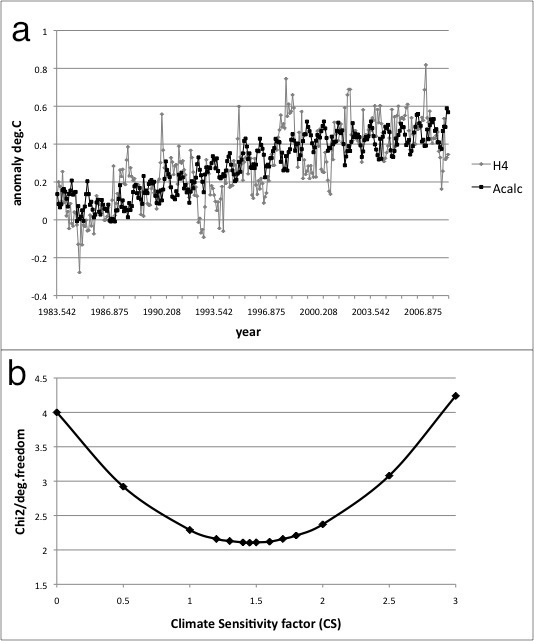 Fig 2 a) Results of the model calculations (Tcalc) for the best fit value of CS =1.45 (TCR=1.6 °C) compared to monthly Hadcrut4 anomaly data. b) Variation of χ2 per degree of freedom calculated between the predicted and the measured anomalies calculated for different CS values taking NCF=0.91 as measured by CERES. Clouds and CO2 alone cannot explain all the variations in monthly global temperatures. It is known that explosive volcanic eruptions and ENSO[E1] also have transient effects on global temperatures, and for this reason it is no surprise that the minimum Χ2/df > 1.0. However the main trend is well reproduced by the model as shown in Figure 2a which compares the best-fit value of CS to the real measured data. The general warming trend until 1998 can mostly be explained by the fall in cloud cover during that period. The flattening off in temperature since 1998 coincides with a leveling off in global cloud cover. To explain observed warming over the full period by a CO2 dependent term alone with clear skies (NCF=1) would require TCR = 2.2 °C resulting in an approximate linear increase of 0.7 °C over this time period. Examining the yearly change in cloud forcing shows that it increased from 225.5 W/m2 in 1984 to 262.2 W/m2 in 1999, or an increase in forcing of ~0.7 watts/m2. CO2 forcing with TCR = 1.6 °C increased by 0.54 W/m2 over the same time period. This result demonstrates that more than half of the rapid warming observed in the 1980s and 1990s can be explained by a decrease in cloud cover. Since 1999 net cloud forcing has remained approximately constant (-0.2 W/m2), while CO2 forcing has increased by a further 0.58 W/m2. Results for the summer cloud analysis for a) Northern Hemisphere with model TCR=1.0C and NCF=0.9 and b) Southern Hemisphere with model TCR = 1.65C and NCF=0.91. The Hadcrut4 data and the model data for each year are the averaged results for June, July and August in case a) and for December, January and February for case b). In the latter case the year is assigned to that of December. There is a clear difference in dependence with CS for the Northern and Southern Hemispheres. Changes in cloud cover have a greater impact in the northern hemisphere than in the southern hemisphere. This affects the best fit values for CS for each hemisphere. There are marked seasonal variations in cloud cover for each hemisphere – particularly in the southern hemisphere. In order to isolate differences between the long-term effects of clouds in each hemisphere we have made summer averages of temperature and cloud cover (June, July, August (JJA) for Northern Hemisphere (NH) and December, January, February (DJF) for Southern Hemisphere (SH)) and then compared the model with the hemispheric HadCRUT4 anomaly data. For the average summer hemispheric insolation we take a value of S0=312 W/m2 which is 240 W/ m2 corrected for the angle of the sun for summer months. The results of this analysis are shown in Figure 3. There is a clear difference between the northern hemisphere and southern hemisphere. The response to cloud forcing in the northern hemisphere is stronger with fixed NCF=0.91, and leads to a lower c2 fitted value for CS (TCR = 1.0 ± 0.3°C). The southern hemisphere shows a smaller cloud forcing response with correspondingly larger values for CS (TCR = 1.65 ± 0.3°C). This difference is most likely due to dominance of oceans in the southern hemisphere. By studying each hemisphere separately and by eliminating as far as possible seasonal effects, the global result is confirmed. These results demonstrate that over half the warming observed between 1983 and 1999 is due to a reduction in cloud cover mainly effecting the northern hemisphere. The apparent slowdown in warming observed since 1999 coincides with a stabilization of global cloud cover. In an analysis of cloud and temperature variance in the UK, Mearns and Best  reach a similar conclusion which is that approximately 50% of net warming since 1956 is due to a net reduction in cloud cover. However, in that study NCF was estimated empirically to be 0.54, significantly lower than the CERES value of 0.91 used here. A lower NCF factor means that clouds are having a larger effect and the difference between the global and UK results may reflect latitude and the fact that UK data are land based only. 1. Randall, D. A. Cloud Feedbacks. Frontiers in the Science of Climate Modeling (2006). 2. Randall, D. A. & Wood, R. A. Climate Models and Their Evaluation. (Cambridge Univ. Press: Cambridge [u.a. ], 2007). 6. Bony, S. et al. How Well Do We Understand and Evaluate Climate Change Feedback Processes? Journal of Climate 19, 3445–3482 (2006). 10. Rossow, W. B. & Schiffer, R. A. Advances in Understanding Clouds from ISCCP. Bulletin of the American Meteorological Society 80, 2261–2287 (1999). 14. Keeling, C. D. et al. Atmospheric carbon dioxide variations at Mauna Loa Observatory, Hawaii. Tellus 28, 538–551 (1976). 15. Solomon, S. et al. Contribution of Working Group I to the Fourth Assessment Report of the Intergovernmental Panel on Climate Change. (Cambridge Univ. Press: Cambridge [u.a. ], 2007). 16. J. Kirby et al. Role of sulphuric acid, ammonia and galactic cosmic rays in atmospheric aerosol nucleation, Nature 476, 429–433 (2011). Note: I have posting this only now because after a long review process the paper was finally rejected. I am beginning to despair of any outsider ever getting anything published in a climate science journal! This entry was posted in AGW, Climate Change, climate science, Oceans, Science and tagged AGW, Clouds, CO2. Bookmark the permalink. 24 Responses to Do clouds control climate? Thanks for pursuing this Clive. A bit of the history… About a year ago I began looking at sunshine hours – temperature relationships in the UK. Sunny months were warmer than cloudy months – what a surprise! This tweaked my curiosity leading me to the ICCP global cloud data base and quickly getting out of my depth. I looked for help at NASA, Roy Spencer and Clive. NASA were actually very helpful, but fell short of actually wanting to get involved in elevating the profile of their satellite imagery. Roy never replied – I guess he is busy. But Clive bit and got involved and provided data extraction and physics based interpretation that is beyond the ken of most mortals. Global cloud cover is not constant – why should it be? To discover that cloud cover changes should be no surprise. And to discover that these changes influence surface temperatures, equally no surprise. On the publication front. I spent several months in 2013 doing research on this, trying to get papers published, only to learn that the reviewers appear not to understand what it is we are trying to do. Time to get some new journals and some real reviewers. Try Tallbloke and the newly set up Cycle science site, they may consider publishing your data even though it is not about cyclic and pattern recognition. I’ve put your paper on my reading list, alongside Lewis & Crok’s new sensitivity report. I’m sorry to hear that the gatekeepers are as vigilant as ever. What a pity. And there are so many competing studies of clouds already in the literature! Clive, if you put mathjax on your server you could put the equations in Latex and they would be readable. Or, I guess, you link a Latex generated PDF? I will put them into Latex later on today. I was hoping to make do with greek HTML characters but it is best to get it right as you say. Thanks – Latex equations fixed. Looks a bit better now. Thanks ! Yes you are right – fixed now. On my unit it looks worse now. CS is fixed but not deltaS instead there are lots of ‘?’ all over. I now think the ‘?’ may be local to my surfunit. Did it even occur to you that cloud cover is linked to something else that every single decent paper on the subject already takes into consideration, something generically named aerosols? So you are basically plagiarizing single every graduate-school manual on that subject, and instead of correctly attributing the forcing to the reduction in (mostly anthropogenic) aerosols you somehow arrive at the same results and claim it is a “change in the clouds”? And then you are surprised that plagiarism/ignorance does not get into peer-reviewed journals? I think that depends on whether you think the ISCCP satellite measurements were measuring clouds unaffected by aerosols. Since most of the data was based on weather satellites sensitive from optical to infra-red then I doubt they were directly sensitive to aerosols. Even if what you say was true then it would be still an interesting result. Aerosols CAUSE clouds. Really, before trying to ‘publish’ stuff you should start by reading at least the pre-graduate manuals on the subject. It doesn’t matter what ’causes’ clouds. They change radiative balance of the earth both quicker and stronger than either aerosols or CO2. The data show cloud cover has indeed changed. Are they the same Crap basic manuals that teach that the Climate is controlled by CO2 by any chance? Aerosols do not “Cause” clouds, the sun shining on water, especially Sea Water produces most of the moisture for clouds, the Aerosols only allow formation of the water droplets. Other moisture comes from Plant life, without the sun shining on it it would also not produce any moisture. Guess which is the most abundant aerosol found in cloud formation? I think bacteria may be one of the biggest causes of cloud formation, particularly Pseudomonas syringae which provides a surface for water condensation. The biosphere does not stop at the earth’s surface. Salt as a seed for clouds? I guess that depends on the strength of trade winds. I remember also Lovelock arguing strongly that DMS from the oceans were important for seeding clouds, and that this was an example of bio-feedbacks on climate. In other words phytoplankton act as the air conditioning thermostat when things get a little hot ! Yes, mineral specks from rock and sandstorms and Salt Crystals. Man made aerosols would be way down the list. Looks like the earth has its own built in solar radiation management (SRM) – clouds. If surface temperatures increase then more convective clouds form thereby offsetting solar radiation. Of course you are right Clive. Btw I greatly appreciate your contribution to clarifying the gw-debate. But since you dont comment about geoengineering I take it this is a sensitive issue where you are then? Or, if not, then how do you explain IPCCs statement about it?